Jesus must be above all and everything in our lives. No one or anything should ever come between us and our relationship with Him. He is our Lord and God. Our hearts are restless till we rest in Him. How we face hardships and challenges in our lives speaks to the depth of our relationship with Jesus. For when we know He is with us, we face them unafraid. There came to power in Egypt a new king who knew nothing of Joseph. ‘Look,’ he said to his subjects ‘these people, the sons of Israel, have become so numerous and strong that they are a threat to us. We must be prudent and take steps against their increasing any further, or if war should break out, they might add to the number of our enemies. They might take arms against us and so escape out of the country.’ Accordingly they put slave-drivers over the Israelites to wear them down under heavy loads. In this way they built the store-cities of Pithom and Rameses for Pharaoh. But the more they were crushed, the more they increased and spread, and men came to dread the sons of Israel. The Egyptians forced the sons of Israel into slavery, and made their lives unbearable with hard labour, work with clay and with brick, all kinds of work in the fields; they forced on them every kind of labour. Pharaoh then gave his subjects this command: ‘Throw all the boys born to the Hebrews into the river, but let all the girls live. Jesus instructed the Twelve as follows: ‘Do not suppose that I have come to bring peace to the earth: it is not peace I have come to bring, but a sword. For I have come to set a man against his father, a daughter against her mother, a daughter-in-law against her mother-in-law. A man’s enemies will be those of his own household. ‘Anyone who prefers father or mother to me is not worthy of me. Anyone who prefers son or daughter to me is not worthy of me. 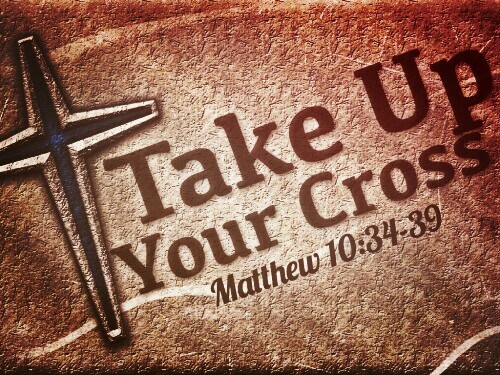 Anyone who does not take his cross and follow in my footsteps is not worthy of me. Anyone who finds his life will lose it; anyone who loses his life for my sake will find it. ‘Anyone who welcomes you welcomes me; and those who welcome me welcome the one who sent me. ‘Anyone who welcomes a prophet will have a prophet’s reward; and anyone who welcomes a holy man will have a holy man’s reward. When Jesus had finished instructing his twelve disciples he moved on from there to teach and preach in their towns.